most people might turn away from this series simply because it is a sequel to the anime chaos;head , but to those who gave it a chance know that it is actually quite entertaining. for those who are confused about what happened in the first half, it is a recap of the chaos head the anime, if you wish to know more about the backstory to that just watch chaoshead... but you cant blame me if you die. as for the actual sequel chaos;child, it has done well to explain a hand full of its characters. as for thee Animation, the entirety of the first episode was well done. as for what was happing in the episode, it diverged from intense gory scenes to interesting conversations about the shows main characters trying to deduct what was happening. in conclusion I believe you should continue watching chaos;child for it will be one of the best of the winter season. Your main character is a shut-in who just wants to stay away from reality, however, a number of very odd murder/suicides are happening in his home town. Between talking to his friend "Shogun" and the fact he stumbles across one of the murders while walking home, Takumi (your MC) gets dragged in. The person who he saw committing the murder was Rimi, who we later find out is his girlfriend. This starts to send Takumi over the edge, as what he saw, and how she treats him don't add up. He never really was the most stable though, as indicated by him hallucinating that his favorite video game character, who looks strikingly like Rimi, is real and is his girlfriend. He tries to run away from reality to his video games again, but gets dragged in a couple more time by the other members of the main cast (his sister, the class rep, a rock idol highschooler, Rimi, and Shogun), and every time we get a little bit more info on what is really going on. BUT literally nothing in this show is as it first appears. The device that is mentioned to change perception, which Shogun created, is now well past the testing stage and has gone into production. Society seems to have cast aside reality in favor of a sort of shared consciousness (or perhaps has been FORCED to). The problem? People who have gone insane can force their delusions onto this shared perception! Things start to get even more WEIRD. All of your main characters are insane, some due to family circumstances, some due to disease, some due to torture, etc. and have created weapons with their delusion to fight the spread of this shared consciousness. Shogun IS Takumi, or rather, the main character is Shogun's idea of what a healthy version of himself would be, a delusion he forced on reality. Takumi's sister gets kidnapped by the CEO of the company that is trying to spread the shared delusion as bait for Takumi who is some kind of Chosen One. Things get fuzzy from here, at least in the anime. When everything is resolved, IIRC, its a all happy world where Shogun is gone, Takumi is real, and all of your main characters have returned to being happy, because they beat the Big Bad CEO who was trying to control the shared reality. Well... I know I said I'd wait till it was done to update, but, its gone far enough to tell. The show disappointed me. They tried to make the show easier to follow... but in doing so lost the unique perspective the made the previous one interesting. They follow a VERY similar plot to the previous one, meaning that you aren't missing anything by skipping this show, and about half way through they have an event that turns things SUPER dark... and even straight up admit it was just for the shock factor. T.T Dropping this at episode 9, because I really just don't care to see how this tragedy finishes out. An awesome sequel story to Chaos;Head! Plus, another great entry to the Science ADV Productions! Chaos;Child is an amazing sequel to Chaos;Head. The Science Adventure series featuring anime such as Stiens;Gate and Robotic;Notes focuses on science fiction stories that are not so far fetched in the fact that this stuff can happen and that is a key point according to the animation studio. While this is a sequel to Chaos;Head, this anime runs it's own story with it's own characters following up with the Gigalomaniac premise and the delusions projected into reality via these special gifts. The anime starts out very strong and maintains a high level of interest throughout it's course, it is very unpredictable and the plot twists are amazing. There is a lot of reading between the lines and every viewer may take things a different way than others. Some say the series tanks towards the end but I personally think it is a great story and it doesn't tank at all. Every episode was rated by over two hundred people and the lowest rating I saw for an episode was a 4.5 Star - not many people write reviews but a lot of people vote on the episode quality and that goes to show that the anime really is something worth watching - ESPECIALLY if you are a fan of the other Science Adventure productions! Chaos;Child will have you on the edge of your seat and is an emotional roller coaster. 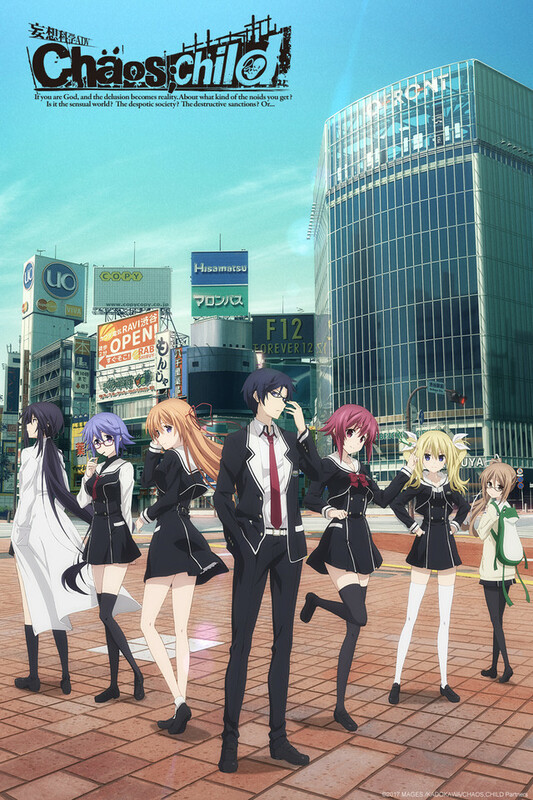 After episode 12, there are two more episodes that were released titled Chaos;Child Silent Sky as an epilogue and it really clears up a somewhat ambiguous ending. The original ending is NOT bad, it just leaves the viewer with a sense of wonder as it ends in a vague sense but all is cleared up in the very last two episodes. (The two epilogue episodes were released about a month after the end of first 12 episodes.) Also, the epilogue explains things about the story that one would have never guessed/expected. Chaos;Child it's extremely interesting and mind-blowing and again super emotional. I guess you could classify the Genre as Horror/Mystery & Psychological Thriller. It is not entirely necessary to watch Chaos;Head to enjoy this anime but it does help to know the story better especially as it follows quite a few concepts established in the first anime. If you can't watch Chaos;Head, don't worry - the first episode has a fill in "speed version" but it does leave out some other important information. I recommend watching the first series before this one but as I said it is not 100% necessary but you will get more out of it by doing so. Enjoy! You;re in for a real treat! I'm not one for the supernatural,(except for fiction :P), or for mysteries or suspense themed animes, but Chaos Child takes the cake in giving me a lovely taste of both with it's plotline and delivery method. Definitely want much more of this anime. Just a personal feeling of disappointment. I can't say that I didn't like this anime. I enjoyed it, but nowhere near as much as I enjoyed the other Science;Adventure series. It just didn't hold up in comparison to the others. It was a grind with an ending that I was personally disappointed in. Not to say that it wasn't proper, but it left feeling like things weren't okay. I understand the reason for the ending, but I was hoping for something more. Hence, the disappointment. It was just a let down. Otherwise, you may find the ending leaving things unresolved. If you like a good gripping plot run, always being given a new angle of interest each episode. This anime is for you till about episode 8... Then quality, consistency, characters having defined traits, and any coherent climactic plot direction go right out the window. Starting in episode 8 and carrying you through the finally you learn what happens when a creator tries to take plot twists and turns to far in some failed attempt at "keeping you guessing" or "adding drama"... All you really end up with is a heaping pile of disappointment. So if you are someone who enjoys complex plots that tend to get lost on most viewers (Occultic Nine, The Fruit of Grisaia, Brynhildr in the Darkness) you might want to avoid this anime. It will start out strong and only disappoint you in the end. Something about this anime had drawn me in before any other mainstream anime such as SAO, and it's safe to say that the enthralling plot line kept me watching. Despite the anime's obscurity at times, the character development had left me with lasting emotional connections to the protagonist and other characters in the anime. It's fine. I've certainly seen worse. I watched the whole thing today, it was okay. Overall I kinda expected it to be a little more psychological and manipulative, but it feels rather straightforward with the murders. Someone died, look at this kinda gory/disfigured body/method! None of them feel super important and half the time the school kids have less reaction then the cops. Overall I found only one scene over all the episodes to be actually disturbing. The other special abilities people have are more typical science-fantasy stuff, nothing crazy or new. The reveal of the first 'bad guy' was not super crazy, they dropped a few hints and I suspected her or being super important as soon as she had the frog that was featured in the prologue/1st series. The second antagonist felt dumb, I get it once ALL the story is reveled but it is not a very satisfying villain or motive for the tone of the show. The open to interpretation style ending was not as bad as some fiction but it would still have felt better to me if the hero had either sacrificed himself to save people or some other dramatic reversal, not just go into a coma for some time and have it fade a 90% happy end for everyone else.